A native New Yorker, James was first introduced to figurative drawing in his teens at the Art Students’ League and Hunter College High School. After graduating from Oberlin College in 1996, James taught art for the next decade at the Rubin Museum, Saint Ann’s School, and various public schools while refining his craft, studying life drawing, painting, and sculpture at Pratt, SVA, and the Art Students’ League. In 2003, he began his classical training in the Russian academic method at Bridgeview School of Fine Arts in New York City. Two years of intensive summer study at Russia’s premier art academy, the Ilya Repin Institute of Painting, Sculpture, and Architecture, cemented James’ affinity for their thorough program and their strict teaching methodology. 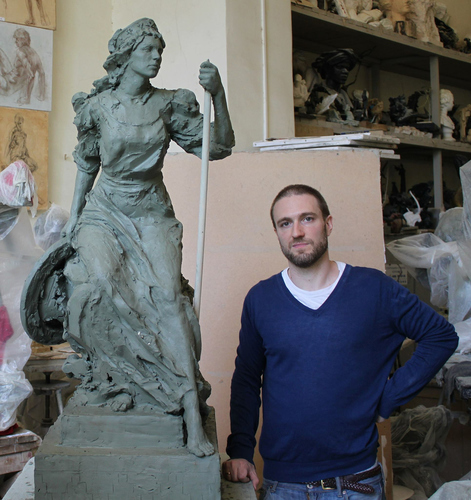 Relocating to St. Petersburg from 2007 to 2012, James became the first American accepted to the Repin Institute’s sculpture department in over 20 years. After a three-year hiatus, in which he taught sculpture and drawing at the Beaux-Arts Academy in New York and Rome, he returned to the Repin Academy in Russia from 2015-2017 to become the only American to graduate with highest honors and be offered a solo show at the Academy. He has exhibited both drawing and sculpture in New York City and St. Petersburg and received various awards including the Gloria Medal at the National Sculpture Competition held at the New York Academy of Art.